Christmas time at the workhouse was a lavish affair. 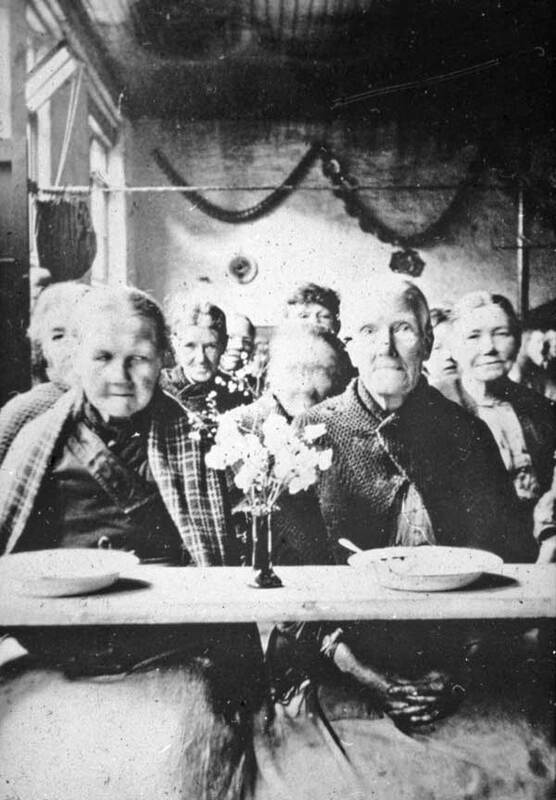 Workhouse guardians called for donations of gifts and food for a festive feasts, the like of which many of the inmates had never seen before. The jovialities were well documented in the newspapers at the time, showing the public a lighter side to the darkly reputed institutions. Rooms were decorated with paper chains and cards, and gramophones played festive tunes throughout the workhouse. During the winter months the workhouses were granted extra money for coal, as well as a further stipend for decorations, toys and other festive extras. In 1905 the King himself donated three guineas towards a Christmas tree for the King's Lynn workhouse. Through public appeals workhouses would receive generous donations, including china for Christmas dinner, as well as games and rocking horses. A piano was often provided for a concert, where visiting singers and bands would perform. People would send presents and letters for the inmates, musical instruments and dolls for the children, tobacco, pipes and snuff for the men, and tea, sugar and sweets for the women. Sometimes these gifts were delivered by Father Christmas himself. The Christmas feast was always greatly anticipated by the inmates. Tables were laid with fruit, nuts, seed cake, mince pies and lemonade. They'd often be given the chance to choose their own menu, given options of rabbit or pork as a change from the usual beef dinner. The inmates at Helston Workhouse even had their own tastes catered for when it came to the main course, their requests ranged from the usual well done or rare to crisp or fatty. The meats were served with plum or apple sauce, and accompanied by parsnips and potatoes. The main course was followed with Christmas pudding, plum pudding or Christmas cake. Sometimes the inmates themselves had helped to prepare the huge quantities of Christmas pudding needed to feed everyone. One dessert that didn't make as frequent an appearance was brandy pudding. Alcohol was a much disputed subject for workhouse guardians, with one dubbing brandy "the devil in solution". It was feared that alcohol could lead to disorderly behaviour, especially as many of the inmates had been forced to the workhouse due to problems with alcoholism. 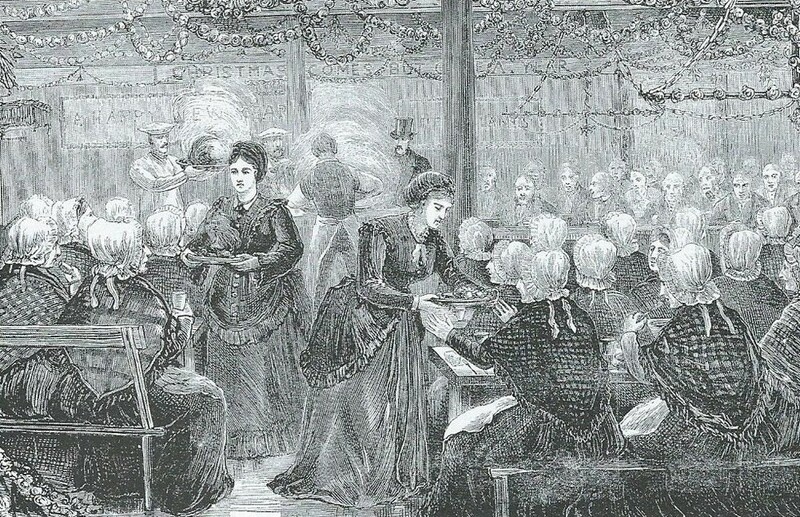 However many thought it unfair to deprive the inmates of a Christmas drink, and a glass of ale was often allowed, so long as it was provided by a private donor and not paid for with workhouse funds. One workhouse guardian dubbed brandy "the devil in solution"
Some inmates argued that the single day of generosity could not make up for the treatment inmates received for the rest of the year. George Roberts Sims, a journalist who concentrated on life for those in poverty during the 19th Century, wrote a poem to this effect, telling the story of a man whose wife was left to starve upon entering the workhouse. He saw the Christmas celebrations as showy affectation, quickly forgotten once the holiday season was over. 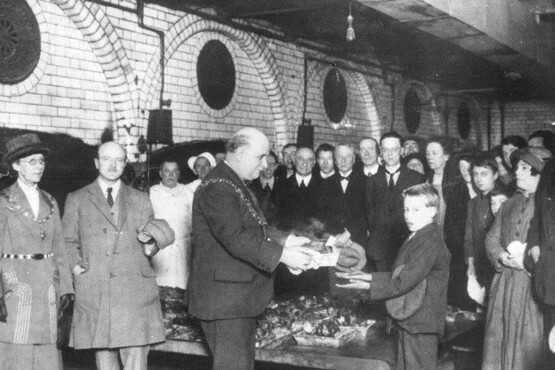 On Christmas Day 1905, radical politician John Burns paid a visit to Wandsworth workhouse. He gave a speech encouraging inmates to view the workhouse as a "temporary resort" from which they could purge themselves of vices (such as alcoholism and gambling) and forge a future career. He reminded them that while their situation was unfortunate, they were able to change the future of both themselves and others. "The future of this country depends not so much on you and me, who are getting old and grey, as on the young women who will be mothers, and on the ones they rear. Whenever you come in contact with them, urge them from the bottom of your heart, and with all the strength of your character, to remove all causes that have brought too many of you to this. If you do that I shall be more than honoured by having had the privilege of speaking to you to-day. I wish you good health, good luck, and prosperity, a merry Christmas, and a happy New Year."